The black and gold bumblebee is one of nine bumblebee species known to inhabit Texas. The fate of bees has been weighing on human minds in Texas and worldwide. Climate change is one reason. Bees are important among pollinators, those creatures that transfer pollen from one plant’s male parts to another’s female parts, the means of reproduction in about 80 percent of flowering plants. However, in an age of pesticides, pavement, parasites, diseases and a disrupted climate from human actions, some see bees struggling to keep up the ancient dance. The honey bee, which beekeepers raise by the billions, is North America’s “most important managed pollinator,” the National Academy of Sciences notes, but what often catches the human eye is its wild cousin, the bumblebee. 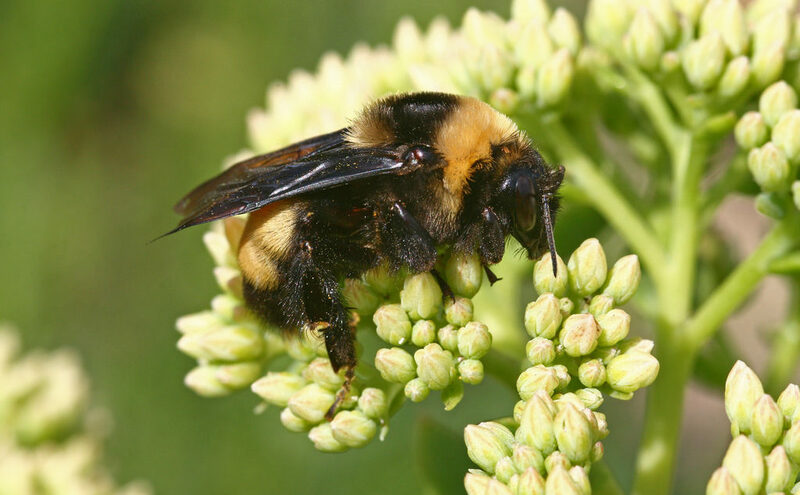 People spot bumblebees easily because they’re relative giants – think of a flying grape. Even their genus name sounds big: Bombus. Even with such worries, there’s surprisingly little known about bumblebee distribution in Texas. New research seeks to plug knowledge gaps and mark priority places for conservation. Past estimates of bumblebee ranges and numbers in Texas came largely from specimens in museums, but that wasn’t sufficient. Biologists recently tried a new tactic: scouring records from the past decade’s volunteer bee counts and other sources. Bumblebees’ visibility makes them good subjects for “citizen science.” The researchers, from the University of North Texas, published their findings last summer in the open-access online journal PeerJ. The researchers also looked at areas with suitable bumblebee habitat as places where conservation might pay off. They pegged a stretch including parts of three ecoregions: Cross Timbers, Blackland Prairie and East Central Texas Plains. It includes sprawling Dallas-Fort Worth and much of the I-35 corridor from Oklahoma south to near Austin. In that area, farms and natural areas, bumblebee havens, are disappearing daily – a 315,000-acre loss in DFW alone from 1997-2012. It’s easy to document habitat loss, but the climate connection to bees is trickier. Small shifts might make subtle but important differences, so figures on average annual temperature and rainfall trends are too coarse to tell the story. Researchers have already found bees changing their ranges and seasonal behavior – due to climate effects not only on them but also on the flowering plants they pollinate. Bit by bit, new studies are filling in some details, but there’s a long way to go, as a research group from the Rocky Mountain Biological Laboratory reported last year. Randy Lee Loftis is an independent journalist in Dallas. He contributes regularly to Texas Climate News as a senior editor of this publication.